Oh, be careful little mouth what you say . . . Whenever you get a group of people together, politics exist. Plain and simple. Someone will have an agenda. Someone will not get along with another. Someone will feel slighted or left out. That is a fact. Tommy Dowling used to remind us that some personalities will naturally shun others, as two magnet faces with the same polarity will push away from each other. That WILL happen. Paul wrote much about how we handle it. He told us to love each other. Peter wrote love covers a multitude of sins. Jesus said the greatest things we can do are to love God with all of our hearts and love each other more than we love ourselves. So why do politics exist in the church?? Pride and self-righteousness (which is a child of pride). That inner need to be proud, to do something that makes us feel important or special. That inner drive to be better than others. IT TEARS A CHURCH APART. And I am finding that I have not only grown tired of all of that, it is starting to make me sick. Physically sick. And I have enough stress in my personal life right now, so I could do without it. Know what I mean, Vern?? She went out to the mound and threw a few pitches, and low and behold, she was not half bad. Okay, so her coaches worked with her but told her the only way she would be better is to practice off the field. Hence, the bucket. We would go out into the yard, I would sit on a bucket, and she would throw the ball ANYWHERE BUT to me. I dreaded it. I made Drew go stand behind us, knowing he would catch far more balls than I. As she continued to work, a friend started working with her. Helping her develop form. He did that for a while. She eventually hit seventh grade and made the JV team at West Florence. 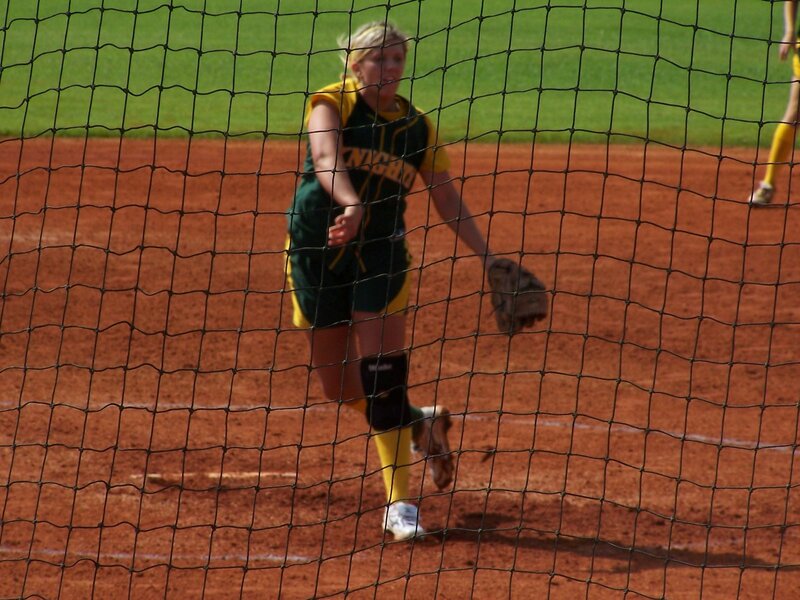 As a pitcher. She was tiny compared to all of the other girls. And our friend told us he had helped her as much as he could. We asked the coach for a recommendation and she brought us to our current pitching coach. She told us Krissy had potential. Over the years she worked hard with Krissy and inspired Krissy to work hard. And I spent more time on the bucket. Yeah, I tried to get her to throw to a bounce-back net. I bought a sports net with a target. No good. She needed a live catcher. So the bucket became our time to talk. There has been pain on the bucket. There has been anger on the bucket. There were a handful of times that I thought we would never pitch again. NOT that I pushed Krissy, because I never really had to do that. But she wears her emotions on her sleeves, and there were times when we packed up and I never thought we would go back. But we always did. The bucket is a symbol of her work ethic. And she is a worker. When she is determined to do something, watch out, because she WILL do it. The bucket also became a great time for a dad and daughter to talk. And talk we did. We have been through some tough times over the years. And our pitching practice was always a time to talk about that stuff. The ups and downs of life. The times where advice was sought. Over this winter, I started realizing that I would miss sitting on that bucket. In spite of all of the times I got hit, I didn’t feel like being there, or other things in life were pulling me away, I will miss the bucket. Because the bucket is no more . . . Last night ended all of that. NO, I won’t get rid of the bucket. I might have a grandson or granddaughter (MANY, MANY YEARS FROM NOW) who wants me to sit on that bucket again. And if I am able, I will. But for now, it will have a place of honor in my garage and in my heart. I will never forget the bucket. Yep, we are getting ready for the last night . . . The last night of the softball season for the West Florence Lady Knights. And the last night in a WF uniform for Krissy! It has been a good ride. She started playing softball in third grade. Couldn’t even catch the ball. In fact, Krissy has broken her nose three times so far in her life, and TWO of them were softball related (the first was when she was learning to catch). She started pitching in the fifth grade. That is when I started catching her in practice. Those times have been some of the best we’ve had, and I plan to blog about that later. Needless to say, this will be a tough night. Walking off that field one more time. But she has nothing to be ashamed of, and no regrets . . . I can assure you that Krissy Wike has given it her best EVERY TIME SHE TOOK THE FIELD. That is what really matters in all of this. So, we are grateful for one last night. 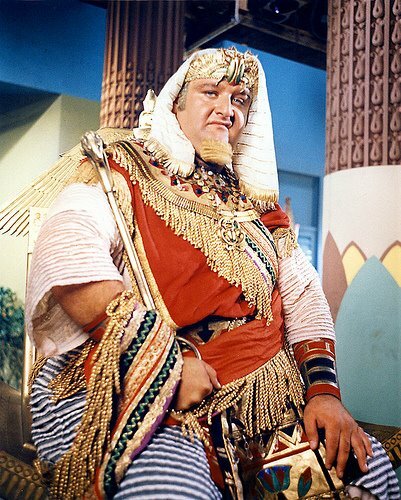 Victor Buono was an actor . . . Comedian . . . An extraordinary entertainer. I first saw him as King Tut on the old Batman tv show. He was AWESOME!! I think that I shall never see… my feet. I think it only proper to end this portion of our discussion with a prayer.